Redownload and Reinstall the Application. This app is for individuals, who wish to attain PMP® certification. 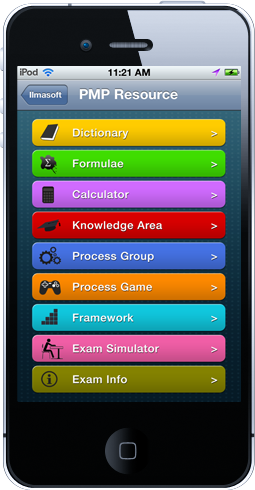 This app is also a valueable resource for people engaged in the field of project management. This app is universal build that can run on Apple mobile devices like iPad, iPhone and iPod touch, for Android devices available on Google play Store and also available for Blackberry Playbook on Appworld Store. What is the validity of the content? PMP® resource (app) holds a derivative licence of PMBoK® guide from PMI Inc USA.The new update comprises of comparison of PMBoK4 & PMBoK5. What platforms are available for this app? PMP® resource is currently available on Apple IOS, Android systems and Blackberry Playbook. How to contact in case of a problem?